This afternoon the northeast trade winds are blowing wavelets, the tide is flooding, and the sun is shining between clouds, warming up the Makena beach area on the southern side of Maui. Right away we see one Humpback whale, then a mom/calf pair, and another single whale among more spread out in the distance. Not much surface behaviors today, mostly breathing and diving for several minutes. 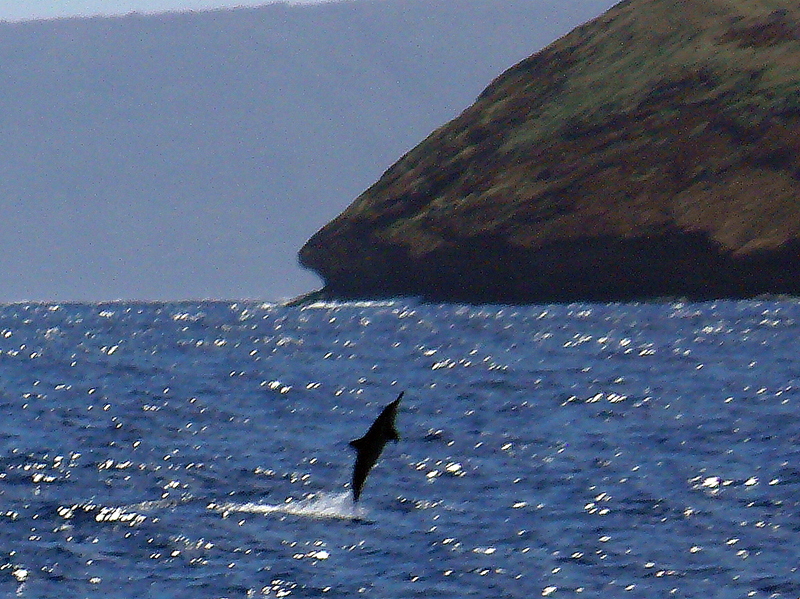 As we head toward Molokini Islet, created by Haleakala Volcano, now with a submerged lagoon so a popular dive-snorkeling site, we are approached by a large community of Spinner Dolphins! They are awake and very active, showing their name leaping up, out of the water, spinning circles in the air!! Many come swim with the boat, so agile riding the bow and stern wakes, zipping across the bow, speed swimming back and forth between their dolphin families and the boat! And how do I describe eye contact with my first cetacean love- the dolphins! « Spring Equinox = Kohola Humpback Breach Day!